The Royal Mail is launching the UK's first digital stamp, a service aimed at small firms. The system, called SmartStamp, allows users to print stamps straight onto envelopes from their computers. It means they can ditch the traditional stamp for an image of their choice, such as a company logo. Subscribing to the service will set users back almost £50 a year, with the cost of stamps, deducted from a prepay account, on top of the initial outlay. The service is not just for small businesses. Anyone can make their stamps at home, but the service costs £4.99 a month or £49.99 a year to subscribe. 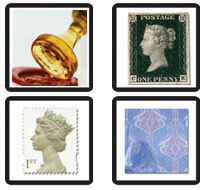 The Royal Mail provides users with software to create the stamps and print them. The computer package also offers guidance on how much it should cost users to send an item of mail, although for heavier packages they may still need traditional scales. "SmartStamp will suit anyone working with a small or home office," said Alison White, head of business products at Royal Mail. "The optimum usage level is about ten letters per day. If you send out about this much post, then we recommend that you seriously consider using SmartStamp." "The Royal mail will allow you to design your own stamp"